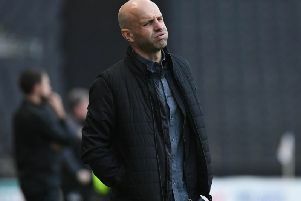 While MK Dons returned to top spot in League 2 on Tuesday, Paul Tisdale was left concerned by injuries to Jordan Moore-Taylor and Chuks Aneke. Alex Gilbey's double against Morecambe saw Dons comfortably past the Shrimps 2-0 at Stadium MK, but with his key defender and striker hobbling off - and Moore-Taylor spotted in a knee brace after the game - the shine was taken off the result somewhat. Tisdale said: "It was a really odd game with Jordan Moore-Taylor going off and having to change and adapt our play, it took us a while to settle again. "There's a pretty good chance he will be out. It's not great, I don';t know how bad it is, but fingers crossed. We've got a deep squad and we have to use it. It's at these times of year you get tested, and we're being tested now. The next challenge will be in 10 days. "Often you can plan your subs and how to alter a game but today I couldn't. I'm hoping Chuks has been wise enough to come off before it's too bad and it's just a twinge." Despite a goal-less first half, Dons barely looked in trouble, despite Andrew Tuttle's free kick being tipped onto the post by Lee Nicholls. Morecambe, sitting 19th in the table, eventually succumbed to Dons though, with Gilbey netting twice to put the game to bed. With Lincoln unable to get past 10-man Oldham at Boundary Park, Dons retook top spot, but it was more of the same from the manager. He said: "There's a long way to go, 20 games to go! I'd be delighted if we still have the same conversation from now until the end of the season! Keep asking me every week, I'll keep saying there's a long way to go! "I've come up against Jim Bentley sides before, and they're very well drilled, professional and counter-attacking, but we knew there was a danger there. We had to be on our guard, and as much as we wanted to play better, it was also about not giving it away, keeping the game moving and I was sure we'd get a chance before too long.